Any edge your small business (SMB) can gain to stay in the ring with your heavy weight competitors is crucial. In a world full of millennial customers, your advantage is your mobile presence. Bottom line—if your business is not set up to serve the mobile population, look for a knock out punch to come from the competition. It’s no secret that SMB is the backbone of the American economy. It’s also no secret that technology is a major factor in a SMB’s success. You would think that as technology continues to evolve that SMBs would have greater opportunities to compete with their larger competitors. This is the case on some occasions, but for most, modern technology is evolving faster than businesses can keep up with, thus leaving many scrambling to understand the changes they need to make.There are two basic approaches that SMBs can use to begin entering the mobile market, apps or mobile websites. Both options have pros and cons, and depending on your business, you will need to do some research. One thing remains certain, if you can afford to build both, you will certainly come out on top with more avenues to reach customers on the platform that they use the most. In a recent study conducted by BuzzBoard, researchers learned that approximately 47.3% of SMB across the nation were not prepared for the shift to mobile (2). The study further reported that 49% of consumers looking for information about local SMB use their smart phones to do so, and of that 49% of consumers, 18% of those searches resulted in customers arriving at a brick and mortar store to make a purchase (7). Simply put, customers shopping and searching techniques are evolving faster than SMBs can keep up with. What that means to you as a SMB owner, is that you cannot afford to postpone developing a mobile presence. Smartphones have dominated the mobile market as of lately. In fact, 64% of Americans or 2/3 of the population own smart phones, and 19% of those people rely on their smart phone as their primary means of staying connected online. 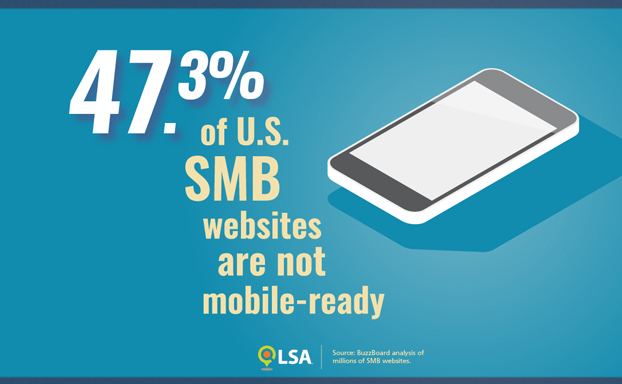 Again, as a SMB owner, you have no choice but to begin developing your mobile presence. By putting it off and assuming that people will just find your website, you are easily loosing 19% of the population as potential customers. Additionally, 68% of all emails are read on smart phones or tablets, so not only do SMBs need to reevaluate their websites and their app market existence, they also have to begin creating mobile friendly emails (8). Due largely to the giant shift towards mobile, Internet giants such as Google have begun revising their business strategies. 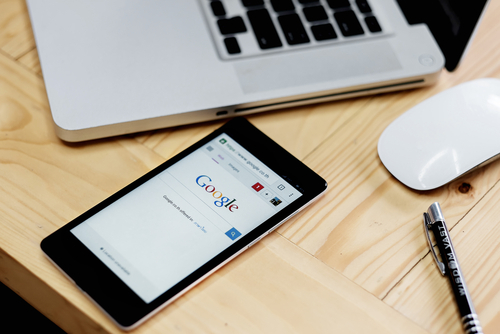 Google recent announced that it would begin changing its ranking criteria by awarding sites with a stronger mobile presence higher rankings (9). The bottom line is when Google says you need to change your online presence, you have to follow suit; otherwise, any ground you’ve gained developing your digital existence will be lost. Your business cannot afford to ignore the rules that Google sets for search criteria. It will end up costing you way more money in the long run. If you wait, not only will you have to spend money developing a mobile website and/or a mobile app, you will also have to pay marketing and advertising experts to help you regain the ground you lost by holding off development. It’s one of those penny smart dime stupid scenarios where businesses often find themselves struggling to make decisions. In the case of developing a mobile presence, the decision is abundantly clear. You need to find the budget to get yourself a smart phone friendly existence. There are many open source websites options you can use such as Joomla or WordPress that offer built in responsive capabilities for a mobile site that can come at a very low cost. In fact, open source content management systems are simple to learn to use of you have some technology skills. They require no coding skills, and they offer many step by step tutorials that you can use to begin building. The same is true with app development. There are also many “build a mobile app” options that can help you cultivate an effective and affordable app without any coding knowledge. With a little legwork, you can have your business competing in the mobile market for relativity low cost. Without a doubt, you have to have a mobile friendly website. First of all, a mobile-friendly website offers a much simpler screen experience potential customers. When a page is easier to navigate on a mobile device, customers are less likely to abandon the page and find one that is easier to view on a mobile platform. If you don’t begin developing your mobile existence with a device responsive website, you are losing out on opportunity after opportunity. You need to be able to contend with your competitors, and without a mobile presence, SMBs in your niche will steal your customers. But in most cases, the mobile website is simply not enough. As more and more technology platforms shift focus towards apps, it is in your business best interest to invest in app development as well. Apps offer mobile capability, but they also offer many additional innovative possibilities. Because an app can work directly with the device on which it is downloaded, it has the potential to allow customers and clients a more interactive mobile experience. Customers like simplicity. The like to go to the app to, book appointments, order supplies, get reminders, check status, etc. Simply put, an app offers a much more user-friendly experience. Studies indicate that 90% of media time is spent using apps instead of browser technology (12). Again, what that means to you as a SMB, is that you need to invest in app technology. A mobile existence is going to be your SMB’s next lifeline, and if you wait too long to invest in the shift, you are going to end up spending more money trying to rebuild the online presence you’ve already built. Watching how the trend unfolds is no longer an option for your SMB. You have to begin adjusting to the change. Sterling, Greg. Mobile: Ready-or Not? Why Small Business Must Adapt Now to the Mobile-First Consumer Marketplace. 1-14: Local Search Association, 2016. Print.